WMM recently partnered with SAGE Elder Care in Summit to celebrate 50 years of Meals on Wheels at a festive event on November 30, 2016 at Canoe Brook Country Club, Short Hills, NJ. With more than 200 in attendance, the celebration raised awareness of the organization and contributions for the SAGE Annual Fund, which will help the organization provide resources for older adults to remain independent and safe at home as they age. SAGE’s Meals on Wheels serves about 44,000 meals to nearly 250 clients annually in 10 communities and is one of the oldest programs of its kind in the country and the longest, continuously running Meals on Wheels program in New Jersey. WMM was a proud corporate sponsor of the Meals on Wheels program to help combat hunger and loneliness in older adults. Questions or comments: contact Susan Gieser (201) 319-5750 or e-mail at sgieser@lawwmm.com. 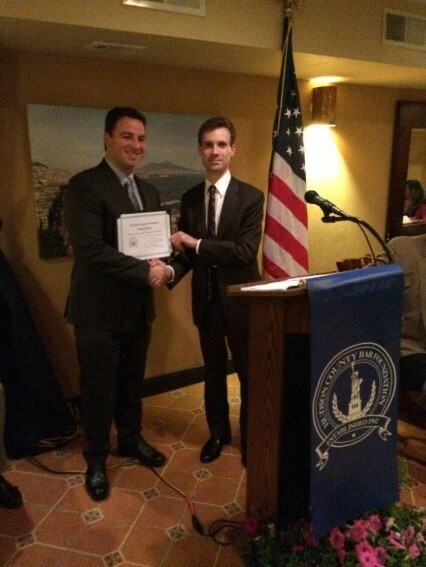 Partner Eric McCullough was on hand at the Hudson County Bar Foundation Annual Scholarship Award Dinner to present the David Waters Scholarship. Eric is pictured on the right presenting the David Waters Scholarship to this year’s recipient. WMM presents the David Waters Scholarship each year to a deserving law student chosen by the Bar Foundation in honor of its former partner the late David Waters. WMM congratulates this year’s scholarship recipient William J. Grapstul a third year student at Rutgers and looks forward to continuing to support the Bar Foundation, legal education and honoring the memory of David Waters with the awarding of the David Waters scholarship. Meeting a Need in West New York WMM Connects with Dvine Konektion Community Development Corp.
Sr. 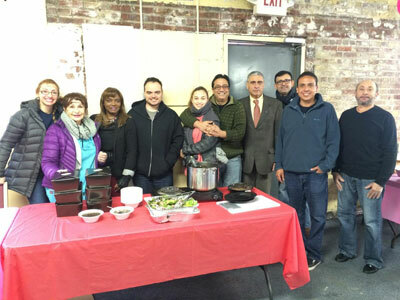 Counsel Jorge de Armas and fellow Rotarians were not deterred by frigid temperatures and snow to give back to the local community. In January and February, Jorge help serve a hot meal and distribute groceries at the Dvine Konektion Monthly Community Health and Wellness Fair in West New York. Volunteer efforts assisted in touching the lives of hundreds of people in the community by providing non-perishable food items, groceries, hot meals, different types of free medical screening, and baby items such as diapers and formula. Jorge regularly volunteers at the Health and Wellness Fair on third Saturday of each month and volunteers are always welcome. Thank you Jorge for your commitment to helping to care for those in the community. Waters, McPherson, McNeill takes the Plunge for Special Olympics. Attorney Joe Norcia braved the 34 degree Atlantic Ocean waters to continue Waters, McPherson McNeill’s tradition of participating in the Polar Bear Plunge! With air temperatures well below freezing, Joe took to the snowy beaches of Seaside Heights for the 22nd annual Plunge and help raise over $1.6 million for the New Jersey Special Olympics. A little crazy? Perhaps, but daring the icy coastal waters of our great state was well worth it for the 6,000 polar bears who fearlessly took the plunge! Great job Joe! Here’s to next year’s Plunge!